Wait, isn’t churros of Spanish or Portuguese origins, but it seems like ‘Korean churros’ are the next big fad is Singapore. 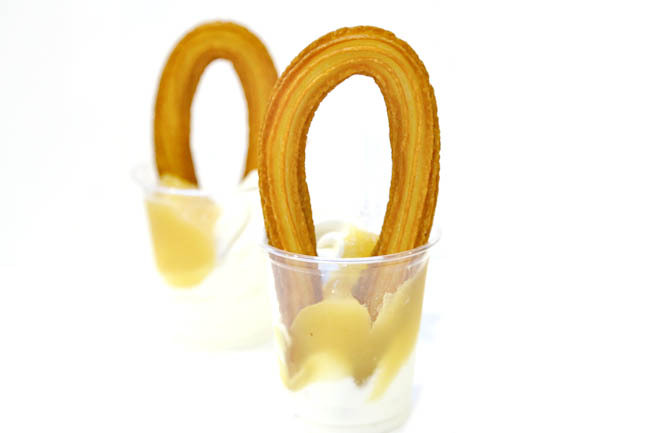 According to one hearsay, churros were brought to Europe from China by the Portuguese, thus the resemblance to dough sticks. Over at Seoul, Churro Factory, Street Churros, Café Chu, Churro 101 are some of the biggest names there. And even McDonald’s are selling these cinnamon sugar-covered fried desserts. Koreans are obviously lovin’ it. 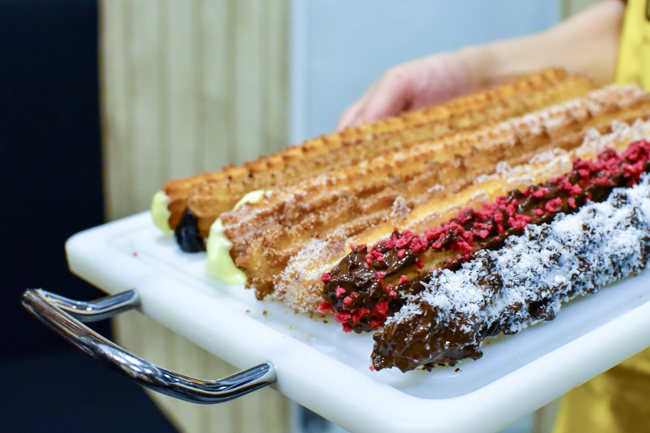 With a total of 18 outlets in Korea, Mr Churro calls itself “an artisanal churros kiosk producing delectable churros with the best ingredients”. Mr Churro offers a 50 cm long (that is 19.7 inches long) Original Churro ($4.50), $0.50 for additional dips in flavours such as Blueberry, Dark Chocolate, Milk Custard. There were also some consistency issues, with varying standards amongst those we tried. Some more crispy, some doughy. Known as the “Better than boyfriend” churros, some of its fans include top K-pop groups likes Girls’ Generation, F(x), Miss A and Girls’ Days. 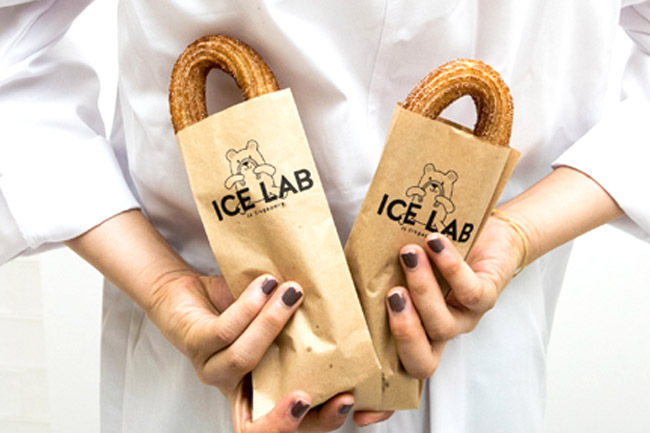 The Plain Churro ($3.30) – handmade from scratch, about 30cm long (Length varies depending on the churro maker). It had a crispy buttery exterior coupled with an airy interior, seemed worth the money spent. 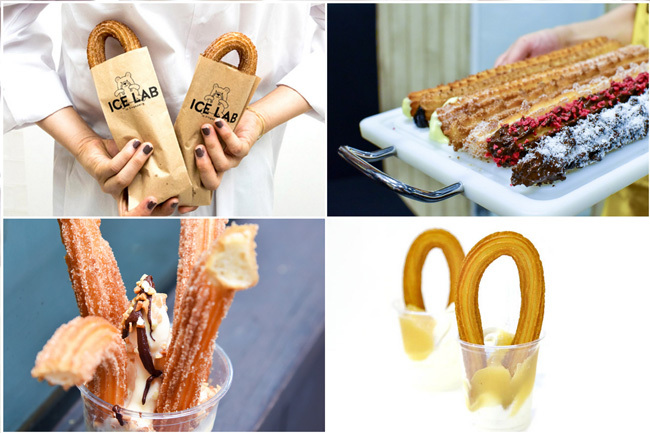 If you like something more colourful and adventurous-tasting, try the filled flavours such as Cream Cheese Churro ($4.70), Chocolate Filled Churro ($4.50) and Milk Mustard Churro ($4.50). The former had a tangy creamy filling, while the latter two were leaning towards being very sweet. This Ice Lab is opened by Korean Comedian Shin Jung-Hwan – famous for his comic dance and silly acts. The Churros ($4.30) is served in a cooking pan – a different presentation. Very crispy and golden brown on the outside and fluffy on the inside, with the right amount of sugar and cinnamon. 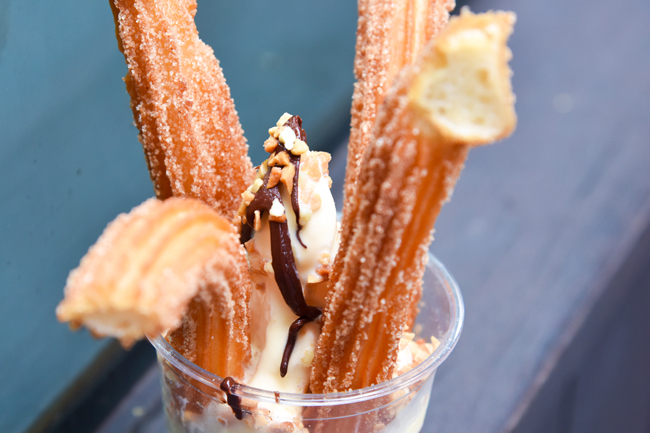 At $3.50, Snowman Desserts’ Ice Cream with Churros with an additional topping of sauce is probably the most affordable all around. Kiwi, Apple, Strawberry, and Red Bean flavours are available. Churros were deep fried on the spot as well, crispy on the outside, doughy which did remind us of youtiao. However, there appeared to be consistency issues and long waiting times as well. * Compiled by Daniel Ang @DanielFoodDiary, Nicholas Tan @stormscape and Hannah Chia @mshannahchia.